Exposure to other dogs is key to stopping his overreaction. Dogs react to other dogs out of aggression or fear, or because they feel territorial. Teaching your dog to tolerate other dogs takes time and patience, but will make life much more enjoyable. If your dog is seriously aggressive, lunging and snarling, seek help from a professional trainer. Socialize your pup. Frequent exposure to other dogs is the best way to teach him tolerance. Ideally this exposure will start when he is young, but it is never too late. 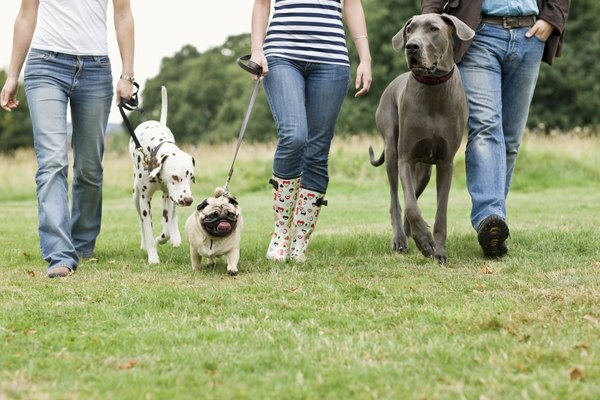 Start by taking him for walks around your neighborhood and to local parks, where he may see other dogs but where there is plenty of room to be on your own as well. As he gets used to seeing other dogs, decrease the space, eventually working up to the point where you can stop and chat with other people who have dogs. Correct growling and pulling at the leash with a firm "no" and a sharp tug back on the leash. Do not overreact, but let him know when his behavior is unacceptable. Distract your dog when you are at home and neighborhood dogs bark. If hearing other dogs bark sends him into a frenzy, use this time to distract him with a few minutes of obedience work or tossing a favorite toy. The key is to focus his attention on you, not what is going on outside. Train your dog to come when called, no matter what. Work on the recall in the house, in the yard, at the park while he is wearing a long lead and any other way you can think of so that he knows, when he hears you call him, he is to come no matter what. Doing this will help enforce that your pup should always be focused on you. Be generous with treats. The more attention your dog has focused on you, the less he will pay attention to distractions, such as other dogs.